Based on past renderings and discussions, it was assumed that a 2-door variant of the new 2020 Ford Bronco would be made, but now, sources say that it is certain. According to Automotive News, top-selling Ford dealers were gathered in Florida last month and shown both two-door and four-door versions of the upcoming Ford Bronco. We’ve discussed how Ford has putting the Jeep Wrangler JL through its paces at its proving grounds in Michigan to gain insights and intel in the development process of the 2020 Ford Bronco. It makes perfect sense now with the confirmation of a two-door Bronco, given that the Wrangler is sold in two-door and four-door variants. The Jeep Wrangler’s success is directly attributable to the availability of a four-door model, but you can still get a short-wheelbase two-door version – which is a hit in the enthusiast community. According to sources, the new Ford Bronco is designed to be customizable, with a removable hard top and removable doors that can be stored in the vehicle’s cargo area – like the Jeep Wrangler. Interestingly, the side mirrors will be attached to the front a-pillars in order to remain in place if the doors are removed – unlike the Jeep Wrangler. This is a major flaw in the fun-having Wrangler, and could win some customers over that are cross-shopping the two vehicles. 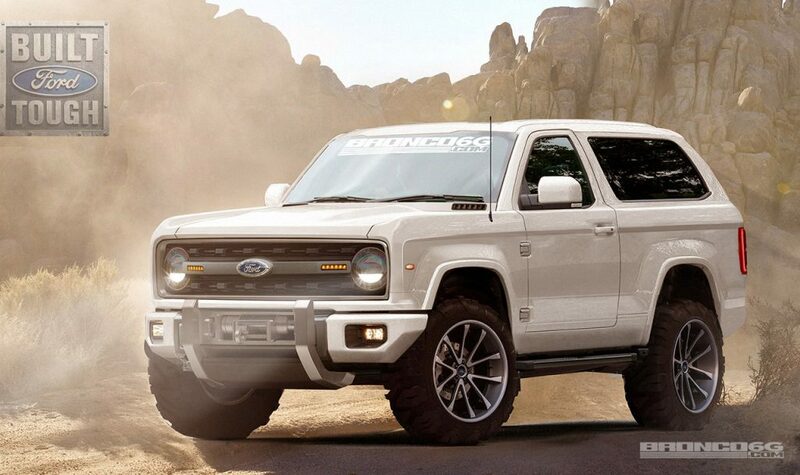 We love the rendering from Bronco6G (above) that has been bouncing around the internet for some time, but if the placement of the mirrors is true, the new Ford Bronco will look a bit different. The news that a two-door Ford Bronco is coming is very exciting, indeed, but when will it actually get here? We’ve already reported that a 2020 Ford F-150 will reportedly come before a 2020 Ford Bronco, so will we be seeing the fun-having Ford any time soon? Subscribe to Ford Authority for the latest Ford Bronco news and around-the-clock Ford news coverage. This is good, because it would not be a Bronco unless it had two doors. “They” said the same thing about the Jeep unlimited. The 4 door outsells the 2 door by average of 2:1. Some places it’s higher.